In our home, we have three rules for faith practices: intentionality, consistency, and simplicity. Without intentionally engaging in our faith practices we tend to leave them behind – either because the practices are forgotten or because we are not truly engaged and are simply going through the motions. Consistency makes an idea into a practice. At least in our house, to be intentional and consistent requires simplicity; I do have a toddler after all! One of the ways in which we have satisfied all three rules (and I’m a serious rule-follower) is in the practice of prayer sticks. Search “prayer sticks” on Pinterest and you’ll find many examples from the simple to the complex. Many people do this activity by writing individual prayer intentions – one on each popsicle stick. For example, people, animals, or other things they wish to pray for. At its most basic, prayer sticks are blank popsicle (craft) sticks on which you write prayer intentions and thanksgivings, in order to spark prayer. For example, one stick might have “Aunt Christine” and on another “our garden.” The containers used to hold these prayer sticks range from simple flower pots and mason jars to highly decorated containers. In our home, I wanted to expand my daughter’s understanding of prayer. I started with four types of prayer: adoration, petition, intercession, and thanksgiving. I then purchased craft sticks in a variety of colors, and wrote the type of prayer on the corresponding color. Our prayer sticks sit in a mason jar near the table. When we set the table each evening, our three-year old places the jar on the table alongside our plates, silverware, and napkins. 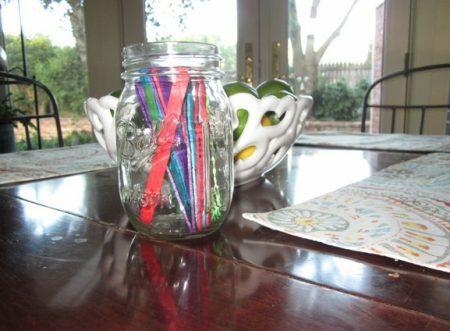 Setting the jar on the table creates intentionality. We would be more likely to forget to pray if the jar were to sit on the table all the time, but by setting it on the table, it becomes part of the meal, just as napkins and forks do. Prayer Sticks is part of the Home Practices series on Building Faith. Check out Home Practices to find more activities for households of all types and sizes. Kate Huston is the Director of Formation at St. Paul’s Cathedral in Oklahoma City where she works with children, youth and adults. Currently, Kate is a member of 2015 class of the Certificate in Leadership for Lifelong Christian Formation. She enjoys spending time with her family: husband Greg, daughter Brigid, and their two large dogs, Rogue and Roxy. Kate holds a B.A. and an M.A. from the University of Oklahoma.